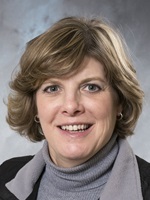 Professor Evenson specializes in educational consultation and instructional coaching. She has been an educator since 1992, teaching at all levels (elementary to graduate-level) and teaching in both face-to-face and online settings. Evenson has experience in school improvement processes, instructional coaching, differentiated instruction, English learners, curriculum and instruction, and Authentic Intellectual Work. As an educational administrator and consultant, she has facilitated many workshops at the local and state level.